but once it heats up, its got that tendency to start pinging when it heats up or when you try to save a few bucks and use less than high test gas! SO NOW WHATS YOUR OPTIONS? you know your prone to detonation damage,if you hear pinging , lower engine speeds and heavy loads with low octane fuel is a very dangerous combo,such as towing up a long uphill grade, with a heavy load at lower engine speeds, can quickly cause cylinder head heat to build. the heat builds rapidly in the combustion chamber if the engine rpms won,t allow , frequent and constant combustion chamber flushing with cooler intake air,and effective cylinder scavenging from the exhaust, and lower engine speeds tend to reduce coolant flow rates thru the heads, it generally makes conditions available to induce detonation, youll also find many manufacturers suggest you don,t tow in overdrive gears as in many transmissions the gear strength in O.D. is lower than when the transmission is in direct drive ,so now what are your options? well the first step is verifying what your dealing with and that requires knowing what your coolant and oil temperatures are during the time the engines running and the peak temps reached, that also requires knowing your ignition advance curve, your installed cam timing and your true engine compression along with the fuels octane. (PLOT IT OUT AND VERIFY DON,T GUESS) theres several things most guys can adjust or change to lower an engines tendency to get into detonation conditions, lowering operating temps ,slowing the ignition advance curve and richening up the fuel air ratio, use of ducted outside air to the engine,a larger radiator and more efficient cooling fans and retarding cam timing are common cures. well I'll assume you previously read the links on engine building,and quench, and you have at least tried to build a well balanced combo with reasonable quench,and tried to match the cam duration and lsa to the engines compression and intended power range, and you selected a fairly well matched cam timing and reasonable compression, but at this point in the tuning ,your still having indications your getting into detonation. OK, detonation potential in a high compression engines hardly a rare issue and if you look into the basic problem you find theres several routes you can take to reduce that problem. theres a very good reason WHY most guys run a separate smaller tank of E85 fuel, thats rather easy to get compared to methanol to use with water injection systems rather than strait water alone and that reason is that water alone in the form of steam is highly corrosive, while ethanol mixed with gas in the form of E85 fuel is considerably LESS corrosive,and can be used to effectively increase octane and reduce cylinder burn temps if used only under high heat and load conditions. this might sound difficult but it may be far easier in some cases than you may think, routing cool outside air directly into the intake or using some careful re=-routing of your fuel supply limes might be all thats required, its not uncommon for outside air to be 50F-100F degrees cooler than air taken from the area around the engine in many engine compartments once the engines up to operational temps, installing a 1" insulated spacer under a carburetor base can be all thats required in some cases. SWAPPING to a longer duration cam or one with a WIDER LSA delays the intake valve close point in relation to the pistons upward movement on the compression stroke, effectively reducing the low rpm compression. I think most people have a pretty good idea of how a TFF works, but lets go through some of the details. First, think of a chamber (say a cube or a disc for simplicty) full of nice calm, still air-fuel mixture. A spark in the middle ignites, and begins to consume the mixture. Ideally, the flame front (in this case a laminar flame front, since the mixture is still) would form a spherical shell, as it progresses. Now, this flame front is propelled by a couple of forces. First, the mixture in the wake of the flame front is obviously heated by the combustion. This heat translates to an increase in pressure. This higher pressure burned gas compresses the mixture ahead of the flame front. Since the volume of the burned gases expands it helps accelerate the flame front. Think of blowing up a ballon. The compression of the end gas also raises its temperature. Flame speeds are higher in higher temperature mixtures. For a turbulent flame front, consider instead of a calm chamber, a chamber full of turbulent eddies, of all size scales. As the flame front approaches one of these swirling eddies, the flame edge is 'torn' and spun around by the eddy, into fresh mixture. This helps to shred up the flame front, and helps to progress the burn of the mixture. In short, this is really why SI engines work at all, lol. Now, this burning action is really a race. As you compress the combustible end gas, you get ever closer to the auto-ignition temperature. Auto-ignition is a process by where a series of branching chemical reactions (which mainly all have a very strong dependence on temperature) result in the combustion of a mixture, with no flame front. These reactions begin to oxide the mixture simply due to the thermal energy available from the high temperature. Now don't get me wrong, this is a VERY complex series of chemical reactions, but some of the basics help give a good understanding. The auto-ignition is very dependent on the time history of the mixture. If you hold the mixture at a low temperature, it may not auto-ignite for a long time. Raise the temperature, and it ignites sooner. So if the TFF takes a long time consuming the mixture, the compression effects of the TFF are present for a longer time, and hence the temp. of the end gas is higher for longer. If the end gas does auto-ignite before the TFF reaches it, or before the relatively cool cylinder wall quenches the flame, the end gas auto-ignites, or detonates. Now, if one corner of this chamber is the last to receive the flame front, and indeed does detonate, what is the result? The auto-igniting mixture essentially 'explodes' and sends a pressure wave across the chamber at the local speed of sound in the cylinder. This pressure wave is what is heard as 'knock' Oddly enough your ear picks up short pulses of a tone, as a 'knock', and not a ringing sound. " 140air wrote: Detonation in an engine occurs when unburned gasses reach their autoignition temperature including the fact that the autoignition temperature becomes lower for gasolines as they break down under heat and time. Therefore, most of the conditions mentioned by other posters can lead to or "cause" detonation. The MAIN cause is specific to the engine. The following is largely from CF Taylor, Ricardo and others. Some of the above characteristics work together and some are mutually antagonistic. David Redszus wrote:Actually, squish velocity begins with piston motion and usually peaks about 7-11 deg BTC and ATC. For an engine that produces 35 m/s at 9 deg BTC, it will produce about 60% of that velocity at 20 deg BTC. Ahh, this is problematic. It depends on how you define "squish". Classically, squish motion is a high speed jet produced by closing the space between the piston and chamber surfaces where the clearance is very tight. What is the difference in charge motion during the initial upward piston motion for a cylinder that has "squish" as opposed to one that does NOT have "squish"? How can we call one "squish motion" at this point? At what point does the charge motion begin to differ significantly (and it differs profoundly between the two cases close to TDC)? This implies squish only comes into play relatively high in the piston's travel. You bring up a good point. When do we have squish and when do we not? All upward piston motion produces charge motion as the piston outer edge scrapes the air from the cylinder wall and moves it inward. As the piston approaches the cylinder head, the diminishing vertical clearance produces an increased gas motion velocity which we have found convenient to call "squish." 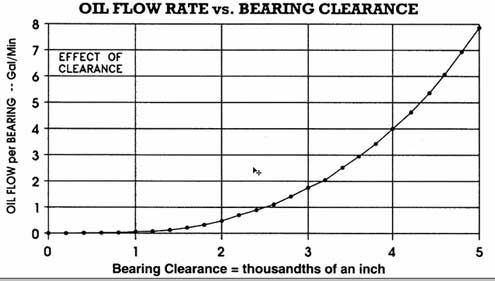 As can be seen, as squish clearance is increased, not only does the peak velocity decrease, the velocity curve becomes flatter. At some point it becomes an horizontal straight line. 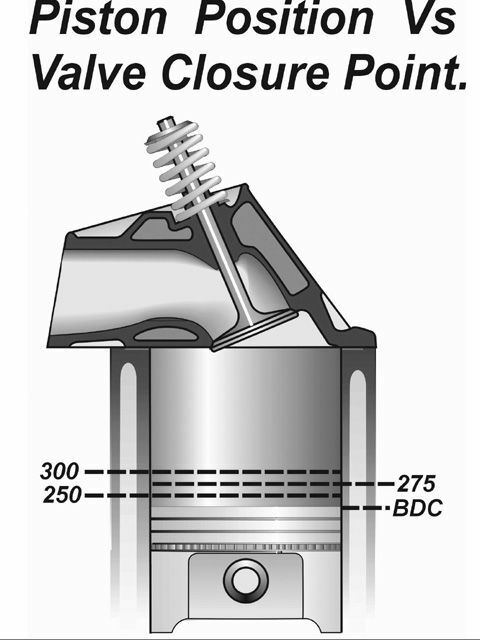 Domed pistons in a hemi chamber are an example of large squish clearances and resulting low squish velocities, unless the piston fits snuggly into the hemi dome. By Dr. Robin Tuluie Ph.D.
Detonation is the result of an amplification of pressure waves, such as sound waves, occurring during the combustion process when the piston is near top dead center (TDC). The actual "knocking" or "ringing" sound of detonation is due to these pressure waves pounding against the insides of the combustion chamber and the piston top, and is not due to 'colliding flame fronts' or 'flame fronts hitting the piston or combustion chamber walls.' Let's look in some detail at how detonation can occur during the combustion process: First, a pressure wave, which is generated during the initial ignition at the plug tip, races through the unburned air-fuel mix ahead of the flame front. Fuel 1 Typical flame front speeds for a gasoline/air mixture are on the order of 40 to 50 cm/s (centimeters per second), which is very slow compared to the speed of sound, which is on the order of 300 m/s. In actuality, the true speed of the outwards propagating flame front is considerably higher due to the turbulence of the mixture. Basically, the "flame" is carried outwards by all the little eddies, swirls and flow patterns of the turbulence resident in the air-fuel mix. 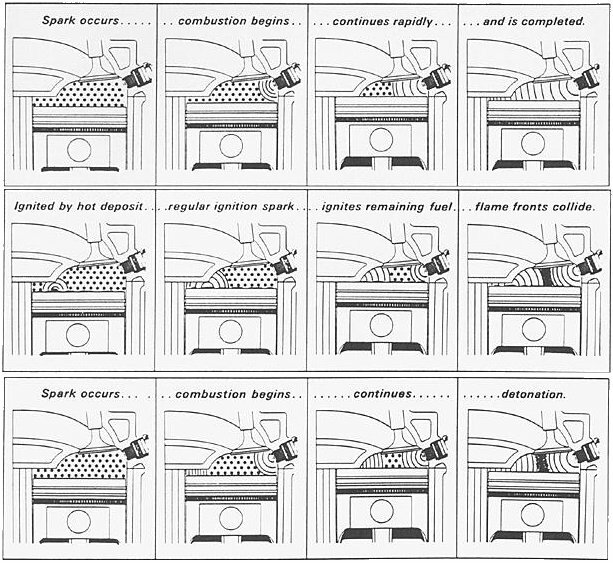 This model of combustion is called the "eddy burning model" (Blizzard & Keck, 1974). Additionally, the genus of the flame front surface - that is the degree of 'wrinkling' - which usually has a fractal nature (you know, those weird, seemingly random yet oddly patterned computer drawings), is increased greatly by turbulence, which leads to an increased surface area of the flame front. This increase in surface area is then able to burn more mixture since more mixture is exposed to the larger flame front surface. This model of combustion is called the "fractal burning model" (Goudin, F.C. et al. 1987, Abraham et al. 1985). The effects of this are observed in so-called "Schlieren pictures," which are high-speed photographs taken though a quartz window of a specially modified combustion chamber (Fig. 1, above). Schlieren pictures show the various stages of the combustion process, in particular the highly wrinkled and turbulent nature of the flame front propagation (initially called the flame 'kernel'). A higher degree of turbulence, and hence a higher "effective" flame front propagation velocity can be achieved with a so-called squish band combustion chamber design. Fuel 2 Sometimes a swirl-type of induction process, in which the incoming mixture is rotating quickly, will achieve the same goal of increasing the burn rate of the mixture. 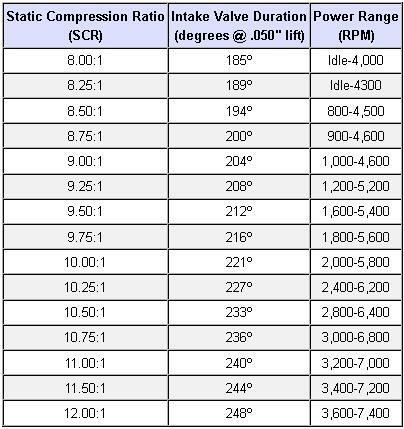 As a general rule-of-thumb the pressure rise in the combustion chamber during the combustion phase is typically 20-30 PSI per degree of crankshaft rotation. Once the pressure rises faster than about 35 PSI/degree, the engine will run very roughly due to the mechanical vibration of the engine components caused by too great of a pressure rise. Sometimes, the pressure wave can be strong enough to cause a self ignition of the fuel, where free radicals (e.g. hydroxyl or other molecules with similar open O-H chains) in the fuel promote this self ignition by the pressure wave. However, this can still occur even without the presence of free radicals; it just won't be quite as likely to happen. This is why high octane fuels, with fewer of these active radicals, can resist detonation better. However, even high octane fuel can detonate - not because of too many free radicals - but because the drastic increase in cylinder pressure has increased the local temperature (and molecular speed) so high that it has reached the ignition temperature of the fuel. This ignition temperature is actually somewhat lower than that of the main hydrocarbon chain of the fuel itself because of the creation of additional radicals resulting from the break-up of the fuel's hydrocarbon chains in intermolecular collisions. Detonation usually happens first at the pressure wave's points of amplification, such as at the edges of the piston crown where reflecting pressure waves from the piston or combustion chamber walls can constructively recombine - this is called constructive interference to yield a very high local pressure. If the speed at which this pressure build-up to detonation occurs is greater than the speed at which the mixture burns, the pressure waves from both the initial ignition at the plug and the pressure waves coming from the problem spots (e.g. the edges of the piston crown, etc.) will set off immediate explosions, rather than combustion, of the mixture across the combustion chamber, leading to further pressure waves and even more havoc. Whenever these colliding pressure fronts meet, their destructive power is unleashed on the engine parts, often leading to a mechanical destruction of the motor. The pinging sound of detonation is just these pressure waves pounding against the insides of the combustion chamber and piston top. 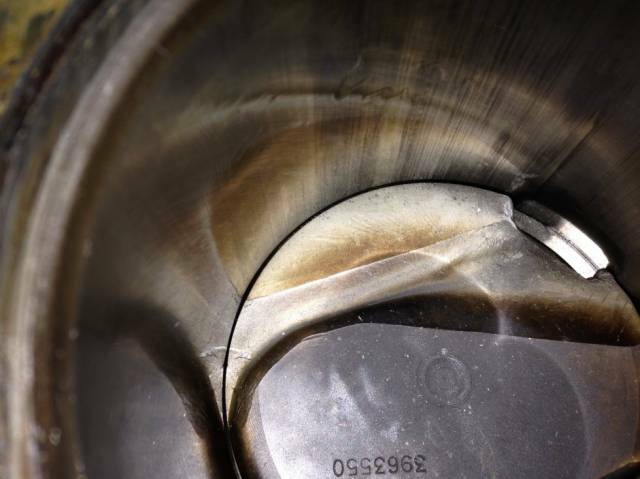 Piston tops, ring lands and rod bearings are especially exposed to damage from detonation. In addition, these pressure fronts (or shock waves) can sweep away the unburned boundary layer (see figure 2 above) of air-fuel mix near the metal surfaces in the combustion chamber. The boundary layer is a thin layer of fuel-air mix just above the metal surfaces of the combustion chamber (see figure 2, above). Physical principles (aptly called boundary conditions) require that under normal circumstances (i.e. equilibrium combustion, which means "nice, slow and thermally well transmitted") this boundary layer stays close to the metal surfaces. It usually is quite thin, maybe a fraction of a millimeter to a millimeter thick. This boundary layer will not burn even when reached by the flame front because it is in thermal contact with the cool metal, whose temperature is always well below the ignition temperature of the fuel-air mix. Only under the extreme conditions of detonation can this boundary layer be "swept away" by the high-pressure shock front that occurs during detonation. In that case, during these "far from equilibrium" process of the pressure-induced shock wave entering the boundary layer, the physical principles allured to above (the boundary conditions) will be effectively violated. The degree of violation will depend on (a) the pressure fluctuation caused by the shock front and (b) the adhesive and cohesive strength of the boundary layer. 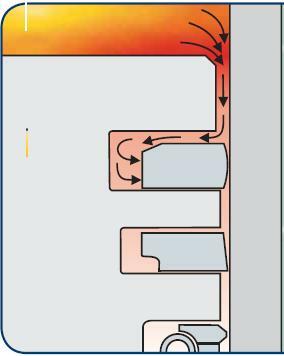 These boundary layers of air-fuel mix remain unburned during the normal combustion process due to their close proximity to the cool metal surfaces and act as an insulating layer and prevent a direct exposure of metal to the flame. Since pressure waves created during detonation can sweep away these unburned boundary layers of air-fuel mix, they leave parts of the piston top and combustion chamber exposed to the flame front. This, in turn, causes an immediate rise in the temperature of these parts, often leading to direct failure or at least to engine overheating. Scientists and engineers have recently begun to understand combustion in much greater detail thanks to very ambitious computer simulations that model every detail of the combustion process (Chin et al. 1990). Basically, a complete computer model includes a solution to the thermodynamical problem, that is a solution to the conservation equations and equation of state, as well as a mass burning rate and heat transfer model. In addition, a separate code (called a chemical kinetics code) models the chemical processes which occur during combustion and sometimes juggles several thousand different chemical species, some in vanishingly small concentrations! Needless to say these codes require huge amounts of memory and CPU time that only the largest supercomputers in the world can provide. They are far beyond the reach of the private individual and usually only employed by large research institutions or major car manufactures. grumpy i have to admit i have never felt dumber than after just reading that last post... i have no idea what most of that is trying to tell me. it seems kind of vague, i guess. does squish prevent detonation? does it cause it? what chamber and pistons designs can we put together to prevent detonation? i always assumed keeping a high volume of coolant flowing through your head will keep detonation at bay but after reading that i think my theory is flawed somehow. also i had been under the impression that a larger rod stroke ratio keeps the piston around TDC longer and that somehow also prevented detonation. but again, after reading that i think thats hocus pocus too. Lots of different theories on what Rod to Stroke Ratio is best. Some say 1.9:1 is best. Others like 1.5 Or less. There is a strong correlation between an engines particular combustion chamber design & what Rod to Stroke Ratio works best with it alone. Pontiac V8 engines from 1955-58 Had Reverse Cooling systems original. A pair of Water Tubes mounted external to both cylinder heads from the water pump to Front of heads. Come 1959 with the 389 V8, the Reverse cooling system was dropped. No need for it at the time. High test. Leaded. Gasoline was readily available then. Now that cars are equipped with knock sensors, the sound of detonation is seldom heard. In a race car with open headers, it’s virtually impossible to hear knock, but the damage and destruction caused by detonation can be extensive – and very expensive. Detonation is the uncontrolled self-ignition of gases in the cylinder. What’s so serious about a little self-ignition? Simply this: those gases burn with an explosive intensity that hammers pistons and melts parts. During normal combustion, the spark plug ignites a flame front that moves smoothly across the cylinder. Hydrogen and carbon atoms in the fuel combine with oxygen in the cylinder in a chemical reaction that releases energy. The resulting increase in heat and pressure causes more oxygen and hydrocarbon molecules to collide in a chain reaction, like the balls on a billiard table. This creates the cylinder pressure that pushes the piston and transfers the fuel’s energy to the connecting rod and crankshaft. That’s how it’s supposed to work. However, during abnormal combustion, things get messy. Like any chemical reaction, combustion takes time. Even though the flame front only has to travel few inches from the spark plug to the edges of the cylinder, the rapid rise in temperature and pressure can cause the spontaneous ignition of residual end gases, creating secondary flame fronts. When these uncontrolled flame fronts collide, the resulting shock waves hammer engine components unmercifully. Instead of a gradual rise in cylinder pressure, the untimed combustion of fuel during detonation produces intense pressure spikes. The “knock” and “ping” that can be heard when an engine detonates is the sound produced by these pressure waves. 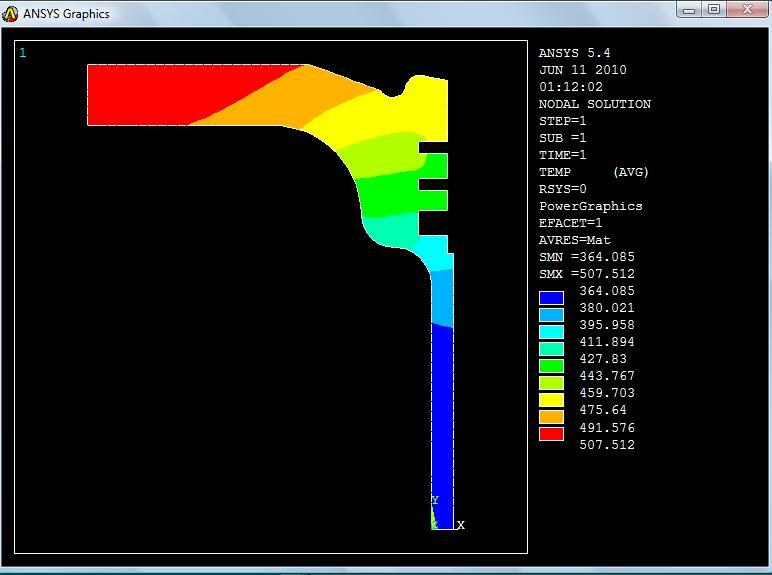 Detonation also strips away the boundary layer that insulates internal engine components from the searing heat of combustion. If detonation persists, localized hot spots ignite the fuel-air mixture before the spark plug fires, escalating the vicious cycle of uncontrolled combustion. In this pre-ignition stage, cylinder temperature skyrockets and the burning fuel-air mixture effectively becomes an acetylene torch that can melt pistons, cylinder heads, and blocks. A racer’s first line of defense against detonation is high-octane fuel. 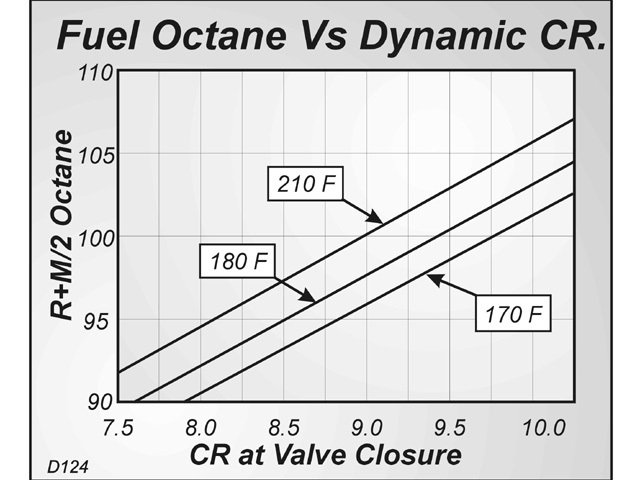 Octane rating is simply a measure of a fuel’s resistance to detonation – it is not about horsepower or heat energy. Octane does have a significant impact on how an engine performs because it is the enabler that can allow an engine to reach its peak potential before encountering detonation. Turbulence in the cylinder can help to forestall detonation by speeding up the combustion process. Clap your hands together, and the air between your palms shoots outward; the same thing happens when the piston approaches the cylinder head. In a wedge-style cylinder head, fuel and air molecules caught between the head and piston are expelled into the combustion chamber, creating turbulence that helps the flame front to travel quickly across the cylinder while the quench area between the piston and head helps to cool the end gases before they can self-ignite. The geometry of the intake port can also induce a swirling motion that promotes rapid combustion as the intake charge enters the chamber. Detonation in a racing engine is often the result of an overly aggressive tune-up – too much spark advance or not enough fuel. An early warning sign of detonation is a loss of crankcase vacuum. Trace detonation can hammer the cylinders hard enough to break the ring seal and cause crankcase vacuum to decrease. Retarding the timing or richening the fuel-air mixture may prevent further damage. While reading spark plugs might seem old-fashioned in this digital age, it’s still the best way to see what is actually happening inside an engine. If an engine is detonating, you will often see “pepper” on the spark plug’s porcelin insulator – small deposits of piston material. You may also see the sharp edges of the ground electrode strap beginning to erode into a radius like the end of a welding rod – another indication of excessive heat. When you spot these early warning signs, it’s imperative to get some heat out of the motor either by retarding the spark timing or enrichening the fuel mixture. Generally it’s best to use a combination of the two. Readings from oxygen sensors are a good reference point to gauge cylinder temperatures, but they are not absolute answers. The 02 readings can be affected by the location of the sensors, their age, and whether they have been contaminated by deposits. It’s impossible to say whether an engine should have an O2 reading or 13.7 or 12.3 because the numbers depend on many variables and factors. The best advice I can offer is to use the oxygen readings to establish a baseline for your specific combination, and then be aware of any significant changes. 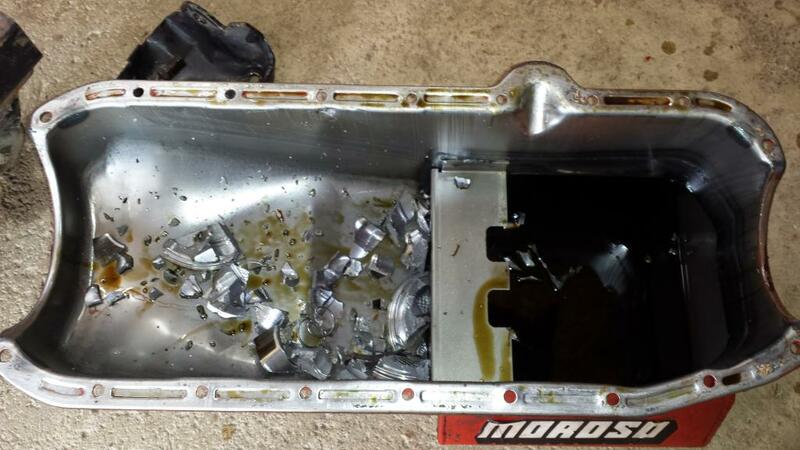 Inspecting parts during an engine teardown can also reveal the operating conditions inside an engine. I look at the free gap on the used piston rings and compare the gaps between the cylinders. When there is too much heat, the ring starts to collapse and the free gap diminishes. A cylinder with a collapsed ring is likely to be the first one to give trouble. When that engine goes back on the race track, it’s going to need an adjustment in the tuneup. I’ll post my annual disclaimer that I am not an engineer, a chemist, or a physicist. I’m a racer and an engine builder, and my comments are based on decades of firsthand experience and observation with gasoline-burning engines. I do know one thing with certainty – detonation is to be avoided! I still Prefer reading Spark Plugs 1st Too Grumpy.